W3 is a region where many massive stars are forming in a string of stellar clusters, located about 6,000 light years from Earth in the Perseus arm of the Milky Way galaxy. W3 is part of a vast molecular cloud complex that also contains the W4 superbubble (not seen in this image). Scientists believe that the extraordinary amount of star formation in W3 has possibly been influenced by neighboring W4, an inflating bubble of gas over 100 light years across. 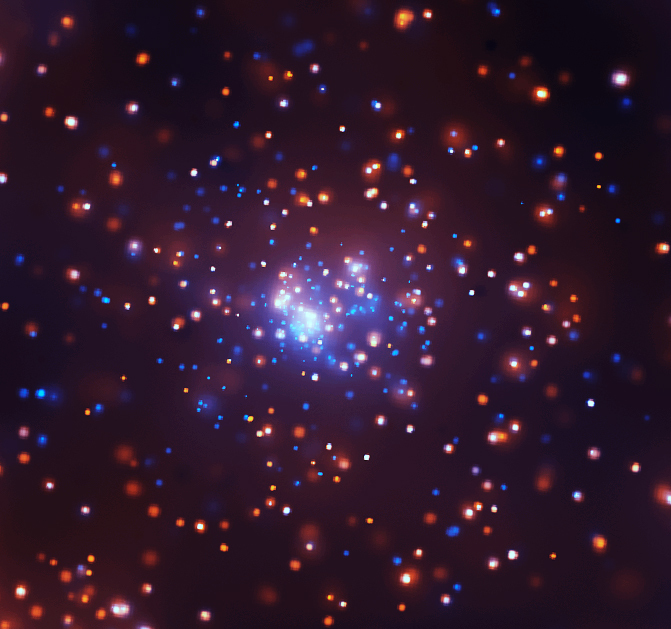 W4 may directly trigger the birth of W3's massive stellar clusters as it expands and sweeps up molecular gas into a high-density layer at its edge, within which stars can form. Another possible scenario is that W4's expansion has caused a domino effect of star formation, forming the cluster IC 1795 (seen as a clump of X-ray sources in the bottom left corner of this image) which in turn triggered formation of the young, massive clusters in W3. 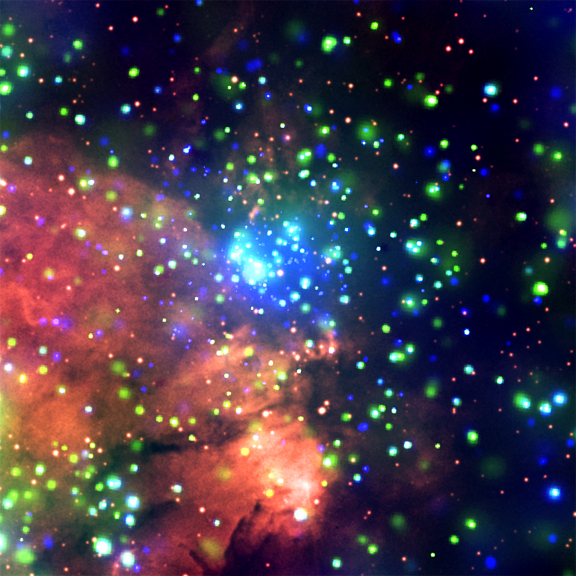 In this composite image of one of the many star-forming complexes of W3, called W3 Main, green and blue represent lower and higher-energy X-rays, respectively, while red shows optical emission. Hundreds of X-ray sources are revealed in this central region of W3 Main. These bright point-like objects are an extensive population of several hundred young stars, many of which were not found in earlier infrared studies. These Chandra data show that W3 Main is the dominant star formation region of W3. Because its X-ray sources are all at the same distance, yet span a range of masses, ages, and other properties, W3 is an ideal laboratory for understanding recent and ongoing star formation in one of the Milky Way's spiral arms. Coordinates (J2000) RA 02h 25m 40.60s | Dec +62° 05´ 52.40"